Join us and see why Hayashi is consistently voted Palm Beach Garden's first choice in fine sushi and Japanese-style dining. Open Monday through Friday from 11:30am to 3:00pm and for dinner every day starting at 4:00pm. 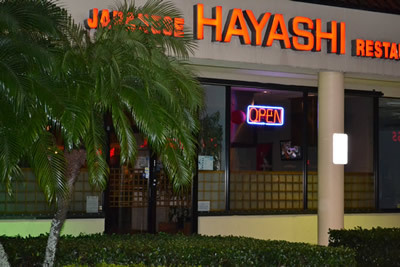 Here at Hayashi Japanese Restaurant, we pride ourselves in having the best sushi in Palm Beach Gardens. With an elegant atmoshpere, talented chefs, and simply delicious food, you can't find a better place to enjoy the best that Japanese food has to offer! We are an authentic Japanese sushi restaurant located in beautiful Palm Beach Gardens, Florida. Feel free to browse our menu, and come in to visit us soon!